Turmeric is hailed as the wonder spice and nutritionists everywhere are talking about it. We can all picture that distinctive yellow powder but where it comes from and what is so great about it? It is obtained by crushing the dried rhizome of the Curcuma longa plant, a relative of ginger. It is found primarily in India and Indonesia and has been used for centuries as a culinary spice and as a natural ayurvedic remedy. Is the praise justified? Well you name it and turmeric may be able help. Arthritis (OA and RA), bacterial infections and viruses, depression, diabetes and insulin resistance, fatigue, Parkinson’s disease and heart disease to list just a few. The key factor is that turmeric, due to its vital curcumin component, lowers the level of the messaging molecules that trigger inflammation. Acute inflammation is a necessity when our immune system rushes into action. It is chronic inflammation that we have to worry about. This can occur when our gut is repeatedly damaged due to our diet or through repeated damage to muscles or joints. Chronic inflammation makes you feel low and it stops your body from working as it should. It is believed that long term low level inflammation can lead to many diseases notably heart disease and cancer. It makes no difference if it’s fresh or powdered let’s just increase our intake of turmeric! Curcumin is not easy for our bodies to absorb but black pepper dramatically increases the bioavailability so always add it to all turmeric recipes. Turmeric is totally safe when used in cooking but take advice if you consider supplements. For me this is the most simple and delicious recipe I have found and you can easily adapt it to your liking . Choose a milk that suits you coconut, almond and dairy will all work. Most recently I have used oat milk. Warm the milk in a pan. Stir for a couple of minutes while simmering and then you can leave it to infuse if you wish. Alternatively you can do the whole thing in your milk frother but do wash it immediately or the turmeric will stain it yellow! I think you can be generous with the black pepper and I finish it off with a sprinkle of cinnamon. You could use cardamon and you could add a little coconut oil to increase the health benefits.. If you find it bitter use honey, coconut sugar or agave syrup to sweeten but taste it first. For me it has an earthy taste and gives me the comfort of hot cocoa. 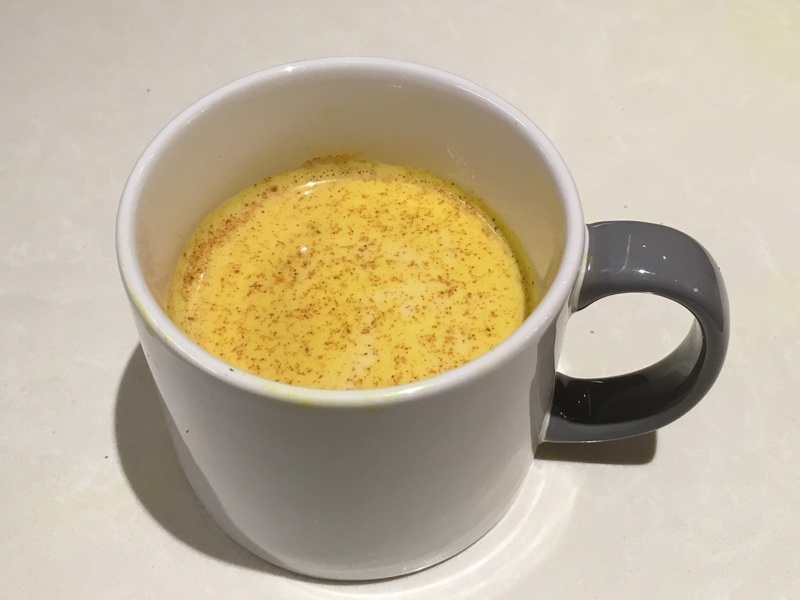 Here is another simple way to add turmeric to your diet on a daily basis. Add this to soups, salad dressings or poured over vegetables: A quarter teaspoon of turmeric powder Half a tablespoon of olive oil and a generous pinch of black pepper. Please note both recipes use black pepper and dissolving turmeric in oil further increases absorption. Enjoy the wonders of nature!